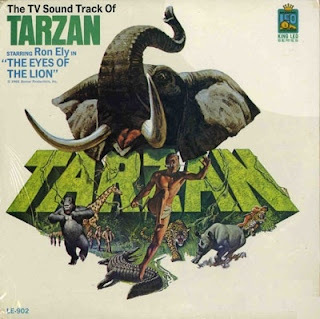 UPDATE March 8th, 2012 - TARZAN, Season 1 coming to Warner Archives. Edgar Rice Burroughs invented several popular fictional characters. His John Carter of Mars will be a 2012 blockbuster as well as Pixar's first live-action production. But next year is the centenary of Burroughs' far more famous creation, a great opportunity to release every Tarzan adaption from the archives. I'm thinking of the 1966 Ron Ely Tarzan TV series. That was the same year of another hit TV show that refuses to hit home video. I've talked about Adam West's Batman and could happily talk about every last one of the 120 episodes Tarzan appeared for two seasons of one hour adventures (57 in all). Unlike many of the early movies, it wasn't shot on a Hollywood studio backlot, but out in the actual jungle. Except, not in Africa. The approach is duly counterweighted by a few 'modern' black characters like the local game warden (Rockne Tarkington of Daktari and Danger Island), who regularly appeared in the early episodes, as well as guest appearances from other American actors like the formidable Woody Strode (Spartacus) and Bernie Hamilton (Starsky & Hutch). The mid-sixties roster of ever-changing guest stars adds to the nostalgia, including James Earl Jones, Nichelle Nichols (Star Trek), Maurice Evans (Planet of the Apes), William Marshall (Blacula) and Julie Harris (The Haunting)... With high production values and the frankly awesome Ron Ely, the series is notably missing from circulation.